The size of this baby-boom had a disproportionate influence on government policies. The graphs were generated from the animation published by the Office of National Statistics. 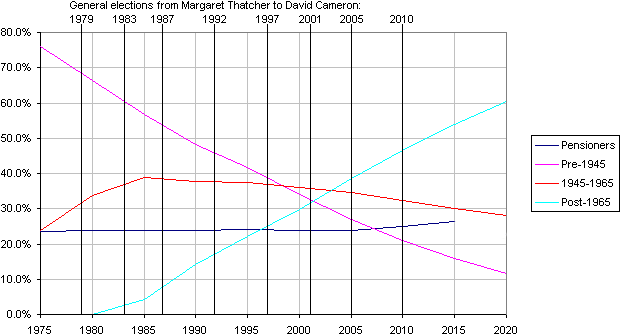 For each year, the height of the graph indicates how many people born that year were alive when that Prime Minister took office. The purple population were those old enough to vote, and the gray ones were too young to vote. The population born from 1945 to 1965 are shown in lighter shades (of purple or gray) for convenience. Which population group(s) do you have to attract (or appease) in order to win? Is there any group whose votes will decide the election so you can risk other group(s) to get those votes? Which age-range(s) do you need to attract? There is a single graph below showing the percentages of various groups in the electorate. There is a commentary towards the end of this article. James Callaghan in Wikipedia. Born in 1912. Came to office in 1976. Never elected to office. 1976: The UK population was 56.2 million. The old-enough subset (1945 to 1958) of the 1945-1965 cohort was 19% of the population; 26% of the electorate. (All diagrams in this article use the female half of the Population Pyramid. This slightly exaggerates the size of older groups because on average women have longer lives. All graphs have linear Y-axis with origin zero so they accurately indicate the relative populations at different birth dates). Margaret Thatcher in Wikipedia. Born in 1925. First elected to office in 1979. Conservative Party Manifesto 1979. Conservative Party Manifesto 1983. Conservative Party Manifesto 1987. 1979: The UK population was 56.2 million. The old-enough subset (1945 to 1961) of the 1945-1965 cohort was 24% of the population; 33% of the electorate. 1983: The UK population was 56.3 million. The 1945-1965 cohort was 30% of the population; nearly 40% of the electorate. This was the maximum percentage in any electorate of the 1945-1965 cohort. 1987: The UK population was 56.8 million. (The graph of the population was not very different from the one below of 1990). The 1945-1965 cohort was 30% of the population; 39% of the electorate. John Major in Wikipedia. Born in 1943. Came to office in 1990, and elected to office in 1992. Conservative Party Manifesto 1992. 1990: The UK population was 57.2 million. The 1945-1965 cohort was 29% of the population; nearly 38% of the electorate. 1992: Virtually unchanged from 1990. Tony Blair in Wikipedia. Born in 1953. First elected to office in 1997. Labour Party Manifesto 1997. Labour Party Manifesto 2001. Labour Party Manifesto 2005 (PDF). 1997: The UK population was 58.3 million. The 1945-1965 cohort was 29% of the population; 38% of the electorate. The post-1965 electorate was 26% of the total electorate. 2001: The UK population was 59.1 million. The 1945-1965 cohort was 28% of the population; 36% of the electorate. The pre-1945 electorate was 33% of the electorate. The post-1965 electorate was 33% of the total electorate. This was the first election with a larger 1945-1965 electorate than pre-1945 electorate. 2005: The UK population was 60.2 million. (The graph of the population was not very different from the one below of 2007). The 1945-1965 cohort was 27% of the population; nearly 35% of the electorate. The post-1965 electorate was nearly 39% of the total electorate. This was the first election with a larger post-1965 electorate than 1945-1965 electorate. Gordon Brown in Wikipedia. Born in 1951. Came to office in 2007. Never elected to office. 2007: The UK population was 61 million. The 1945-1965 cohort was 27% of the population; 35% of the electorate. The post-1965 electorate was 40% of the total electorate. David Cameron in Wikipedia. Born in 1966. Elected to office (in coalition) in 2010. 2010: The UK population was 62.3 million. The 1945-1965 cohort was 26% of the population; nearly 33% of the electorate. The post-1965 electorate was nearly 47% of the total electorate. 2015 (estimated): The UK population will be 64.8 million. The 1945-1965 cohort will be 24% of the population; nearly 31% of the electorate. The post-1965 electorate will be 54% of the total electorate. 2020 (estimated): The UK population will be 67.2 million. The 1945-1965 cohort will be 22% of the population; 28% of the electorate. The post-1965 electorate will be nearly 61% of the total electorate. Here is another way of looking at the same information, once again using the animation published by the Office of National Statistics. (The graph was plotted using values at intervals of 5 years). Percentages after 2012 are estimates. From 1983: Since the last of them got the vote in 1983, the 1945-1965 electorate as a percentage of the total electorate has been decreasing because they are dying and the total electorate is increasing. Up to 1998: The pre-1945 electorate was larger than the 1945-1965 electorate. 1998 to 2003: The 1945-1965 electorate was larger than both the pre-1945 electorate and the post-1965 electorate. The only election in this period was 2001. From 2003: The post-1965 electorate has been larger than the 1945-1965 electorate. From 2013: The post-1965 electorate will be most of the electorate. Pensioners have been a steady 23%-24% of the electorate until a rise to 25%-26% after 2005. This will be changed by the new pension-age rules by 2020. This article complements “The myth of excessive political influence by the post-war generation“. It is obvious from all the above graphs that there was not a baby-boom in the UK starting about 1945 and ending about 1965! 1965 was the peak of a baby-boom, not the end of one. There was a baby-pop from about 1946 to about 1948, then a real baby-boom from about 1955 to about 1974. (And another smaller baby-boom from about 1978 to about 1992). When any of these Prime Ministers first came to power, the 1945-1965 cohort was never more than 38% of the total electorate. Mostly it was much less than this. It has always been in the minority, like every other generation. In the 2001 election for the first time the pre-1945 electorate was smaller than the 1945-65. In the 2005 election for the first time the post-1965 electorate was larger than the 1945-1965 electorate. So the 2001 election was the only one where the 1945-1965 electorate was bigger than each of the pre-1945 and post-1965 electorates. 2005: post-1965 electorate 12% larger than the 1945-1965 electorate. 2010: post-1965 electorate 44% larger than the 1945-1965 electorate. 2015: post-1965 electorate 79% larger than the 1945-1965 electorate (estimated). 2020: post-1965 electorate 116% larger than the 1945-1965 electorate (estimated). Each cohort becomes a smaller percentage of the electorate over time. The population is increasing, and older people are dying, so each cohort becomes “a smaller fish in a bigger pool”. The population in 2010 was about 10% larger than in 1979. About 13% of people born in 1946 died between the 1979 and 2010 elections. So the 1946 year dropped from 1.7% of the population to 1.3% over this time, a reduction of nearly a quarter. It is clear from the lighter shaded region of each graph that there has never been this mythical generation whose mere size caused governments to unduly favour them, or which could commandeer national resources at the expense of other generations. That is typically a conspiracy hypothesis propagated by people who are envious of the successes of a minority of the post-war generation, yet weren’t around to see the struggles of much of the generation. But it is also propagated by rich people on guilt trips. Although Tony Blair and Gordon Brown were born within the range 1945-1965, the average age of members of Parliament is typically about 50. None of these factors appears to have favoured the 1945-1965 cohort. Another group who some people think have had an undue influence on policies because of sheer weight of numbers are pensioners. For most of these Prime Ministers above pensioners have been 23%-24% of the electorate. Then there was a rise to 25% after 2005. It is estimated that pensioners will be a little over 26% of the electorate in 2015. After that new pension-age rules will reduce the rate of increase, but new data on life expectancy will probably increase the estimates.